Following the “tradition” of publishing my stats for my sport or no such sport activities as for 2013. 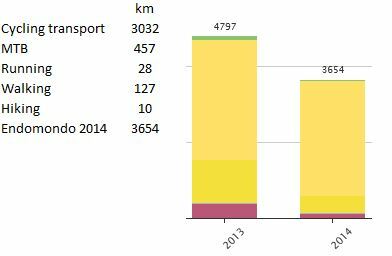 1143 kms less in 2014. than in 2013. and most of this is due to less mountain biking, crappy summer weather with most of rainy weekends didn’t help at all. Some hiking and walking kms that i didn’t record on endomondo due to weaker battery of my smartphone and that wouldn’t survive 5 or more hours of constant activity. Planning to get some quality battery bank so i can recharge the smartphone when i am outdoor. Running numbers were not anywhere close as in 2013., but that’s mostly because i decided to try to increase my bodyweight for a few kilos and of course strength-currently at 77 kg for last few months.